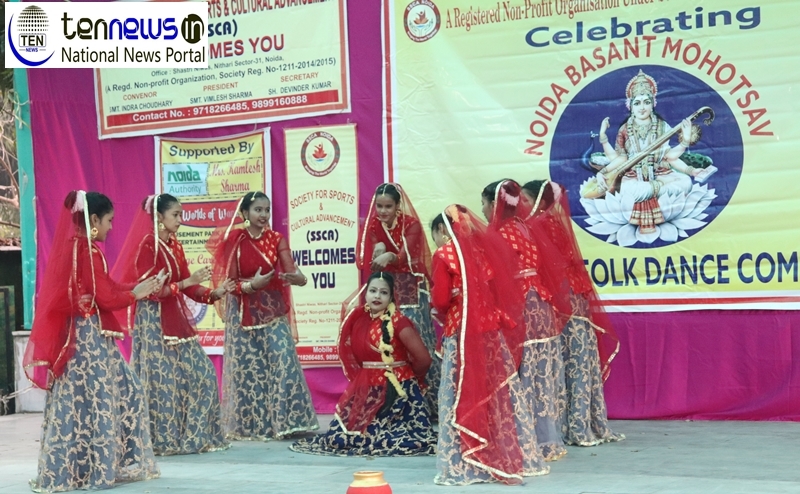 NOIDA :– Today Society for Sports and Cultural Advancement (SSCA) organized its 8th ‘Noida Basant Mahotsav’ in Noida Stadium. It is a inter school dance competition. On the occasion of ‘Noida Basant Mahotsav’, SC Mishra, Senior Product Engineer of Noida Authority remained present as the Chief Guest for the event. Along with Ashok Srivastav of Navratan Foundation, and some other important personalities of Noida as the Guest of Honour. Event started with the tradition of lighting up of lamp by the Chief Guest and Guests of Honour. Following this, Children from different schools of Noida performed folk dance on the stage. The main attraction of the event was the dance performances of children on the songs from different states of India and dances according to their culture. Based on the performances and relatability to the culture of states, students were marked and given rewards by the judges. SC Mishra, while talking to Ten News, said “that this competition is a platform for the children to showcase their talent and gain confidence among themselves”. He also thanked the organizers for inviting him and giving him this opportunity to see those beautiful dance performances by the children of Noida Schools. The main objective of this competition is to show the culture of different states and to increase the confidence of the children. It also gives school going children a platform to evolve as a person by exposing their talents in front of the audience. The event culminates with prize distribution ceremony and vote of thanks.